Description: Erect or spreading shrub 1.5–3 m high; branchlets angled or flattened at extremities, glabrous. Phyllodes linear to very narrowly elliptic-oblanceolate, ± straight, usually 4–10 cm long, 2–5 mm wide, glabrous, midvein ± prominent, obscurely penniveined, apex subacute with a mucro; 1 inconspicuous gland 0–6 mm above pulvinus; pulvinus < 2 mm long. Inflorescences 4–10 in an axillary raceme; axis 1–6 cm long; peduncles 2–4 mm long, glabrous; heads globose, 20–30-flowered, 3.5–5 mm diam., cream-coloured to bright yellow. Pods straight to slightly curved, ± flat, barely to slightly and often irregularly more deeply constricted between seeds, 4–11 cm long, 5–7 mm wide, firmly papery to thinly leathery, glabrous; seeds longitudinal; funicle filiform, ± encircling seed. Flowering: usually June–September, also recorded March, April, October, December. Distribution and occurrence: the Blue Mtns from Mt Wilson south to the Picton district; rare. Grows in dry sclerophyll forest on sandstone. Similar to Acacia forsythii, A. betchei and A. linearifolia but differs in the position of the gland on the phyllode and the perianth details. Named after Margaret Lillian Flockton (1861-1953), a botanical artist who illustrated many works of Joseph Maiden. 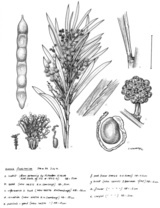 A. flocktoniae is listed as Vulnerable in the Species Profile and Threats (SPRAT) Database.